We can all feel tired of our day to day schedule quite easily, particularly if it’s been a while since you took a break and stopped the hectic running around, in lieu of some well-needed downtime. I, for one, am really terrible at relaxing- I almost feel guilty on the days I chose to do ‘nothing’ and can find myself taking everyone and everything way too seriously when I keep this up for a few weeks in a row. Sona, Ireland’s oldest and largest producer of vitamin and mineral supplements has over 33 years’ experience in formulating some really great quality vitamins and herbal remedies. They seemed to sense that I was stressed and tired and in need of a boost with their spidey supplement sixth sense to see where and how they could help! 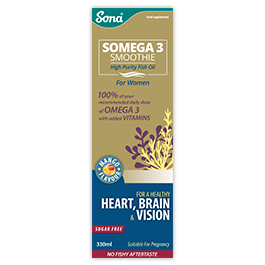 They approached me to try their new SOMEGA 3 Smoothie fish oils, ideal for women leading a busy lifestyle who needs a little boost in terms of their general fatigue, feeling tired etc, and to sharpen their focus and concentration. I jumped at the chance, so for the next two months, each morning, I’m going to try their recommended 1 tablespoon of SOMEGA 3 Smoothie fish oils which (so Sona tell me!) contains my 100% RDA of Omega 3. They also contain vitamin b12, folic acid and d12 which help with stress levels, rheumatoid arthritis, osteoporosis and PMS. Yikes. Where have you been all my life!? 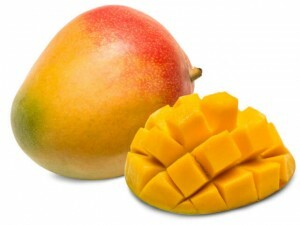 Oh and to flag, they don’t repeat at all on you and they taste like a gorgeous mango smoothie or cocktail which you can take directly or mix with your porridge or smoothie. For any of you out there interested in giving this a try too, you can grab you SOMEGA 3 Smoothie fish oils at pharmacies nationwide. They are also ideal for anyone looking to conceive and indeed those who are already pregnant as they contain DHA which has been found to be essential for both neuroulogical and early visual development for your baby! I’ll report back as to how I’m doing over the coming months or you can follow my journey over on @gymbunnydublin on Instagram. This is a paid post in collaboration with Sona.